He believes, for all intents and purposes as far as relevancy, Microsoft is dead. "If you wait by the river long enough, you'll see your enemy come floating by,"
He is also fore-telling the end of big publishers controlling the book market, as evidenced by his book on self-publishing APE: Author, Publisher, Entrepreneur-How to Publish a Book (I bought it on impulse during his interview, it is actually really interesting butI don't have any plans to self-publish a book -- yet). 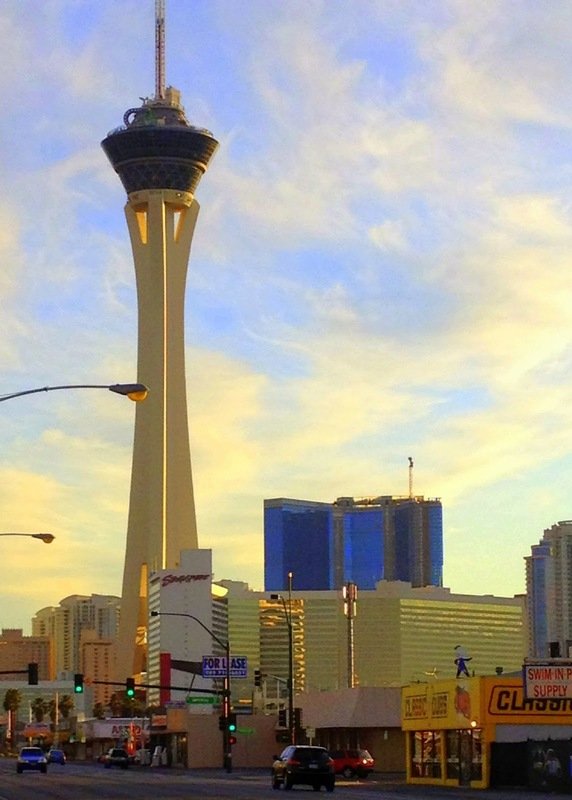 Iconic Stratosphere, Las Vegas, NV, off of Las Vegas Blvd. as seen from Main Street. 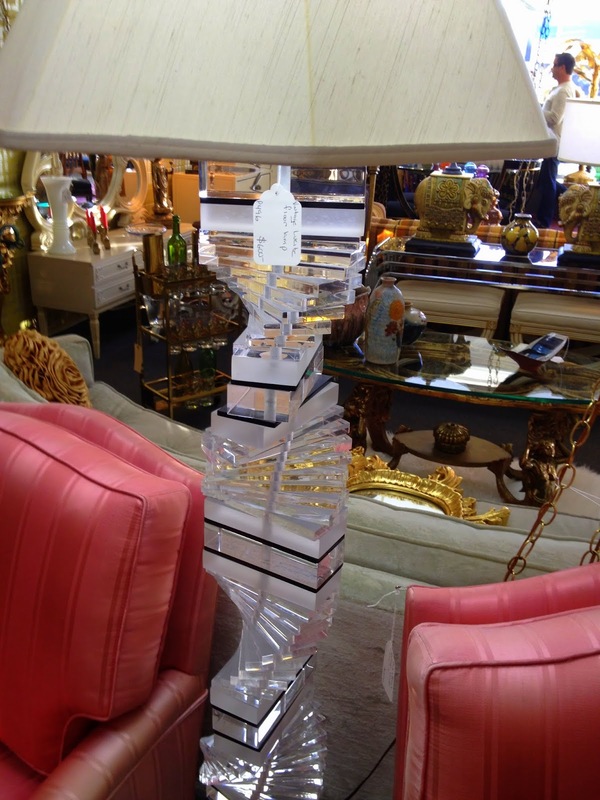 Las Vegas is also a hot bed of new mid-century modern, retro and vintage stores. I took this opportunity to run down to Main Street and Casino Center to see the shops, some less than a year old, that have been established in Antique Alley in the Las Vegas Arts District. 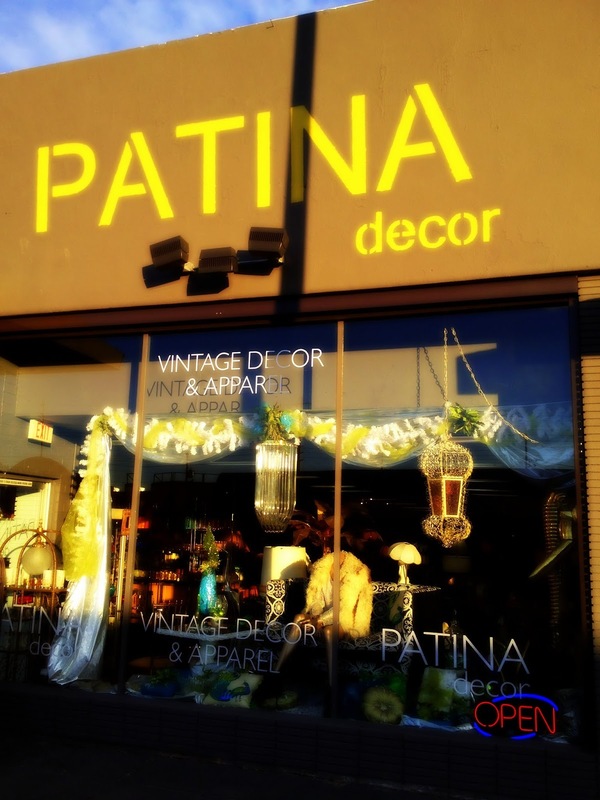 First up was Patina Decor. Honestly, I was beyond impressed. I was most impressed with how high end Patina's merchandise is and how well curated. 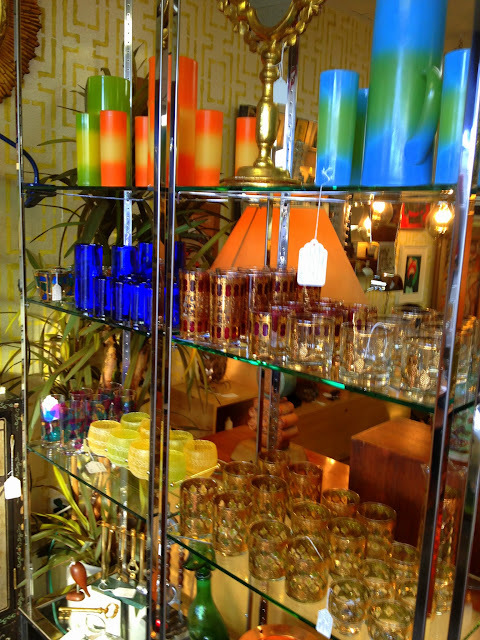 Kate and Tim are NOT stocking kitschy mid-century. Their decor would look appropriate in any Case Study home (for the most part) and certainly very appropriate in any current day contemporary home. 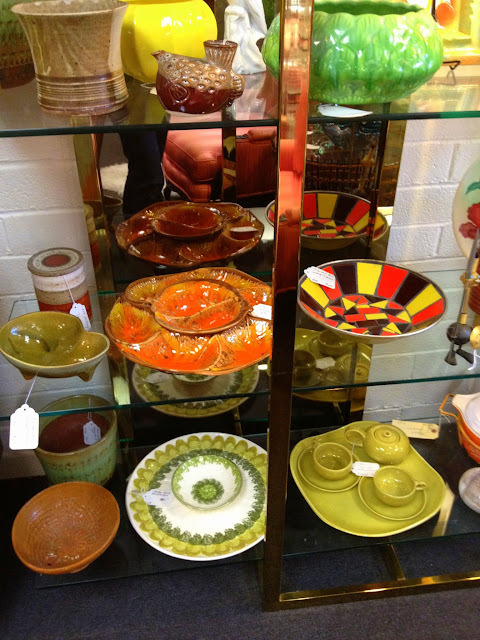 Here is a sample of their wares (iPhone photo tour, apologize in advance for picture quality). This Lucite bar cart is in perfect condition. 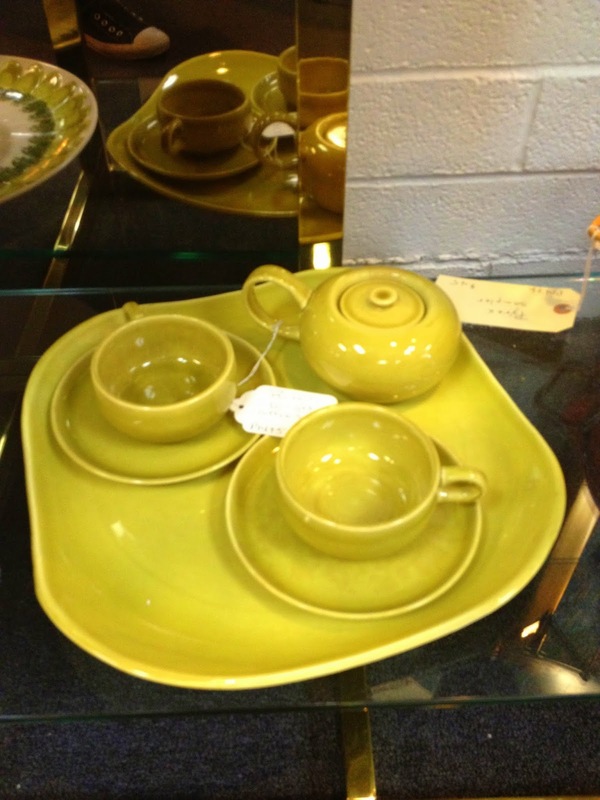 Kate called the incredible assortment of glassware and pottery "smalls" and said that she and Tim liked focusing on "smalls" as well as larger furniture and art pieces. They do a great job. 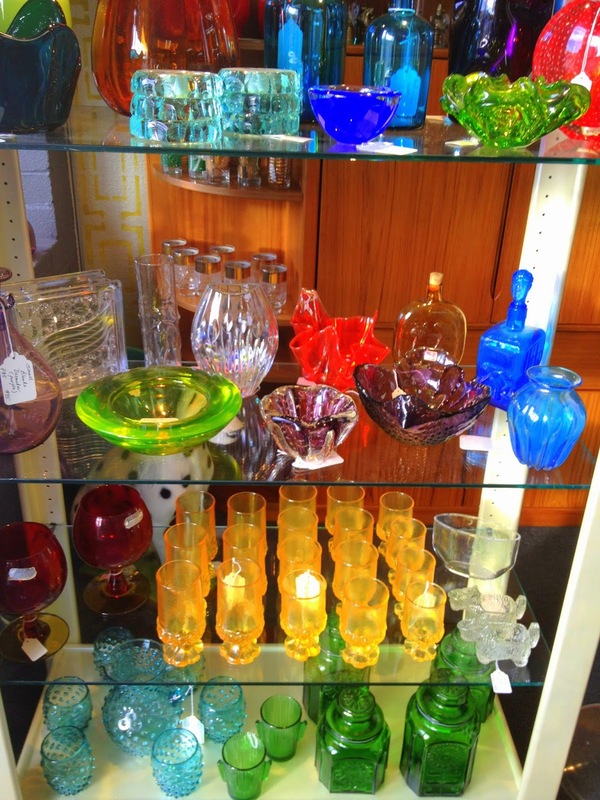 I have such a thing for mid-century modern glass. 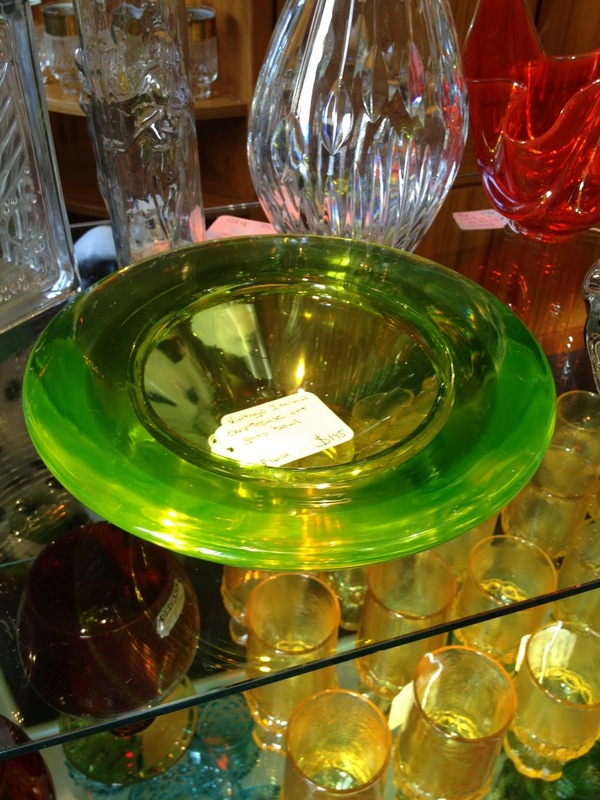 I loved this chartreuse glass bowl from Italy. About $190 if memory serves me right. Super tempting. 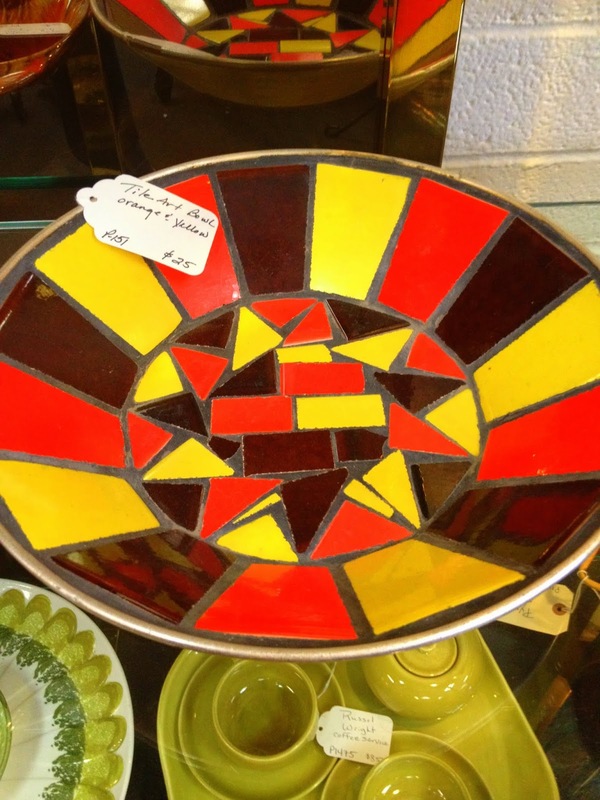 But this fair sized, obviously mid-century covered bowl was only about $60. Reasonable, huh? 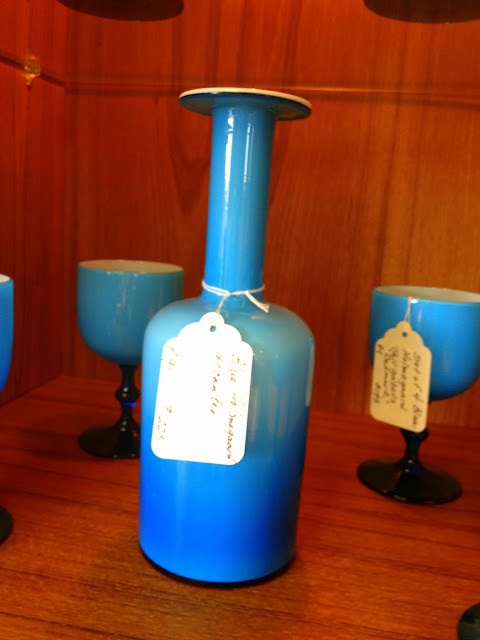 The Holmgaard blue bottle was almost mine. 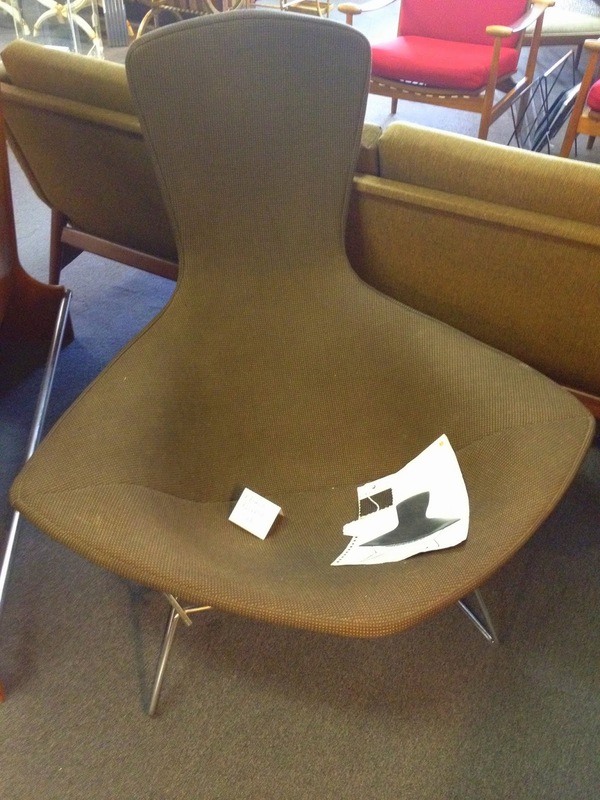 They are offering for $225 I think, which is a really fair price. 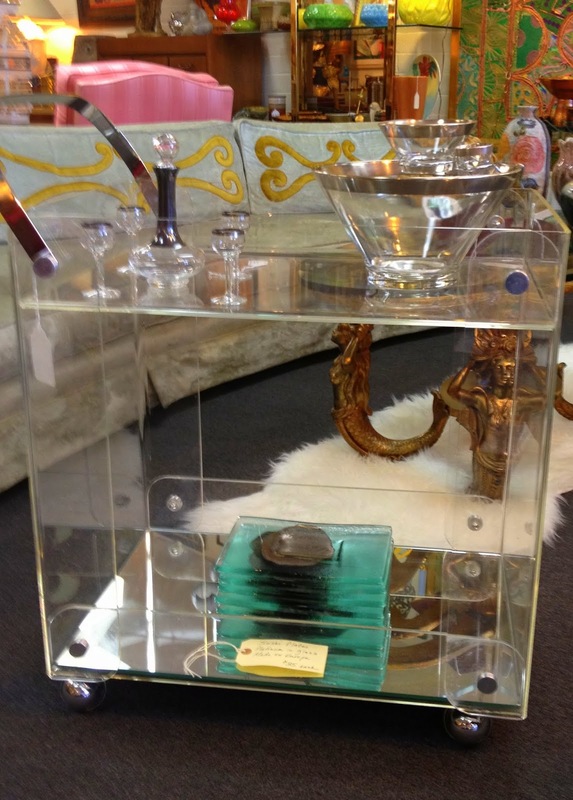 Just look at the barware! Beautiful. Lovely little dining room set. Danish modern probably. Okay, there is some kitschy stuff here. It was the 50's. Hard to avoid. Another cool chair (not a Knoll womb chair but in that vein?). Looks absolutely perfect. More beautiful "smalls." All reasonably priced. A little Russel Wright for Dana, in my favorite color. I bought this little beauty. Wasn't a giant ton of money. Raymoor Italy ($40 if you must know and remember, I broke something in the store too). 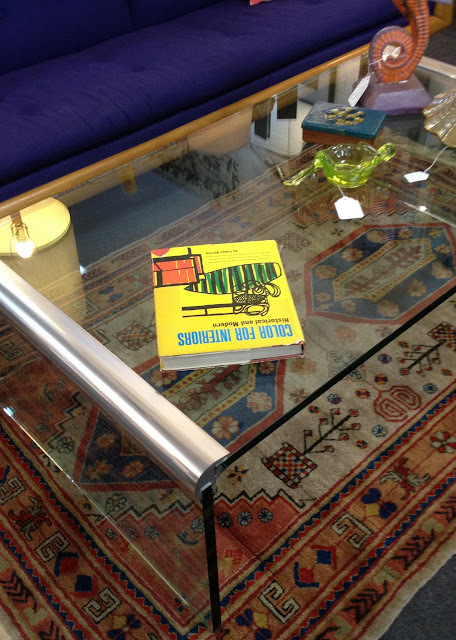 Okay, now I fall apart because I don't know mid-century furniture that well. I love this dresser. Great piece of metal sculpture. 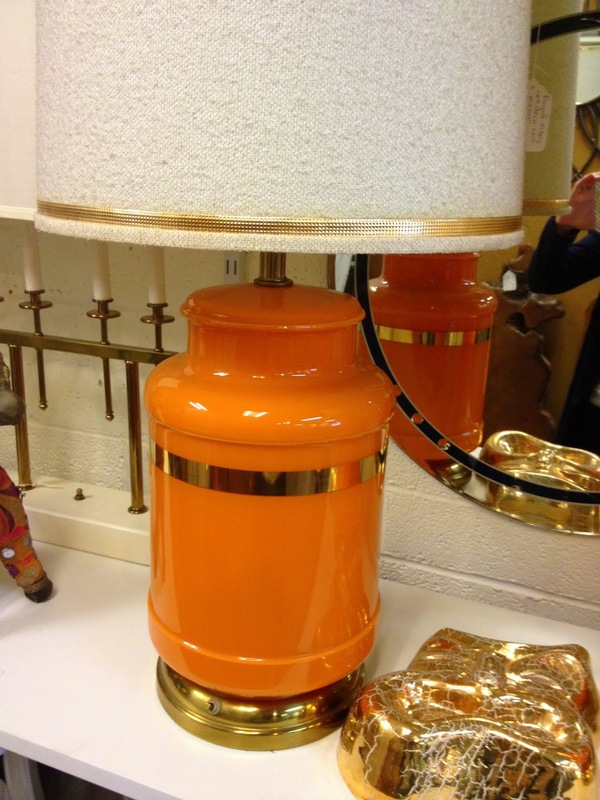 Would look classy in any mid-century modern home, or contemporary home. Great colors. Lots of lamps as a matter of fact. I was so eager to take a picture of this Rosenthal Netter Bitossi pot, I broke a little mug. 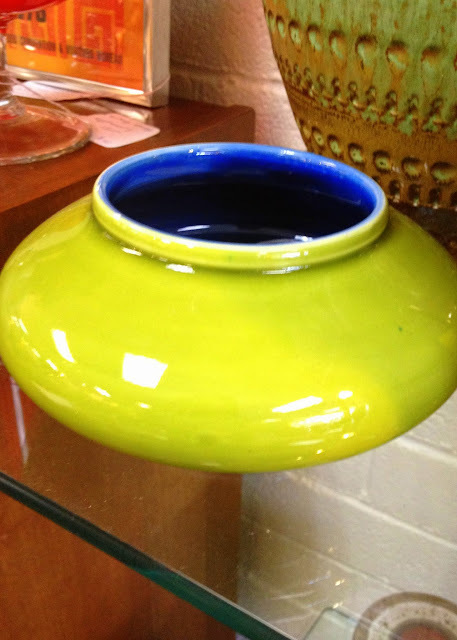 I should have bought this pot because it matches other pottery I have. But, I wouldn't have been able to get it home, and didn't feel like shipping. It was less than a $100 but I can't remember how much. 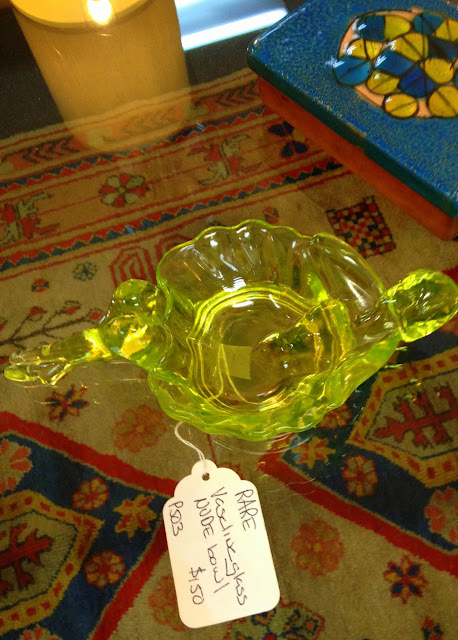 Vaseline glass naked lady ashtray or bowl. I love vaseline glass because it glows in the dark under black lights. I actually have a few pieces. 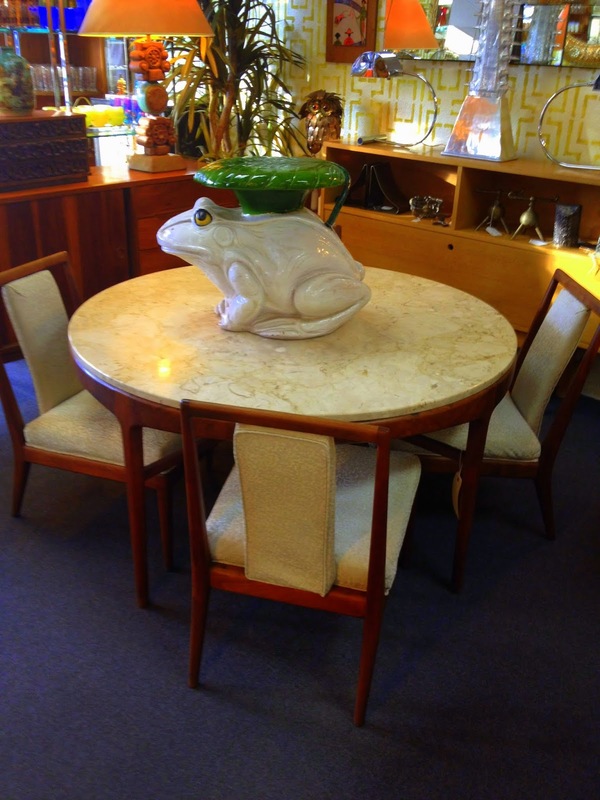 It dates pre-mid-century. Perfect accent chars. Adore the red hot color. 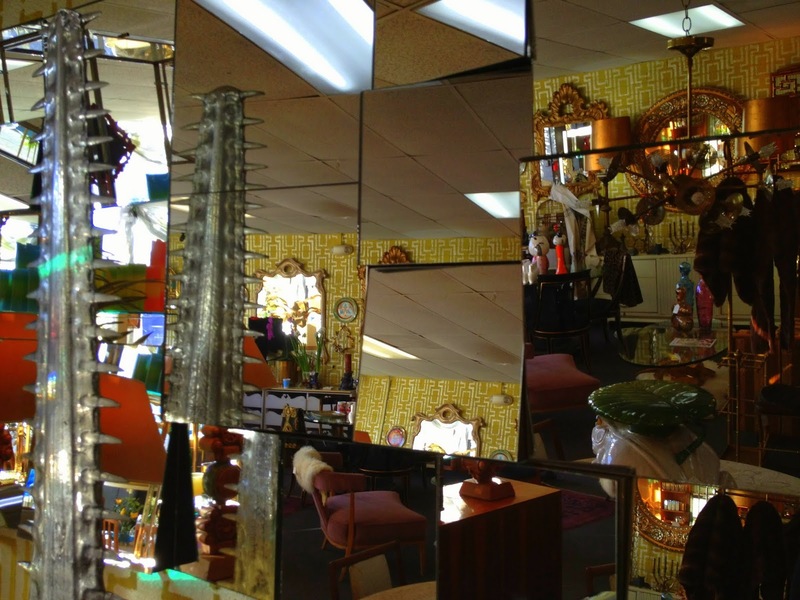 Fantastic mirror wall hanging. The sharp toothy thing looks to be a metal color shark part. 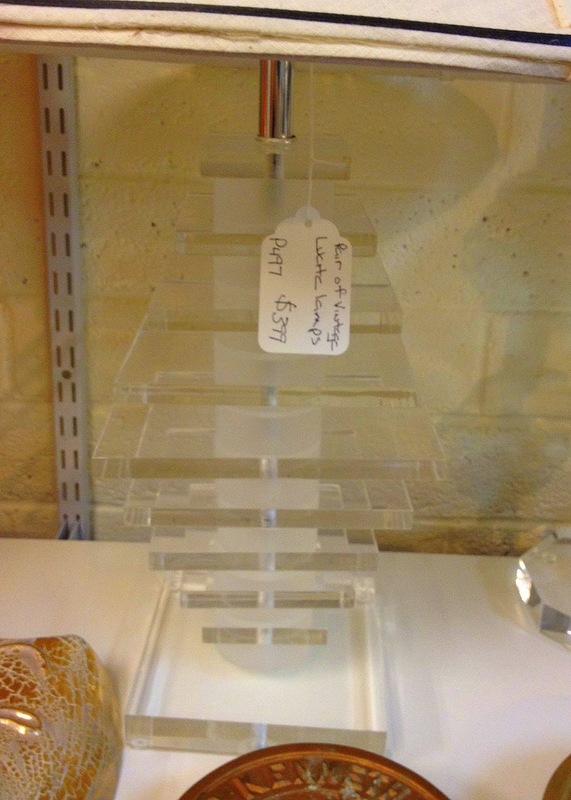 Another fantastic Lucite lamp in utterly perfect condition. 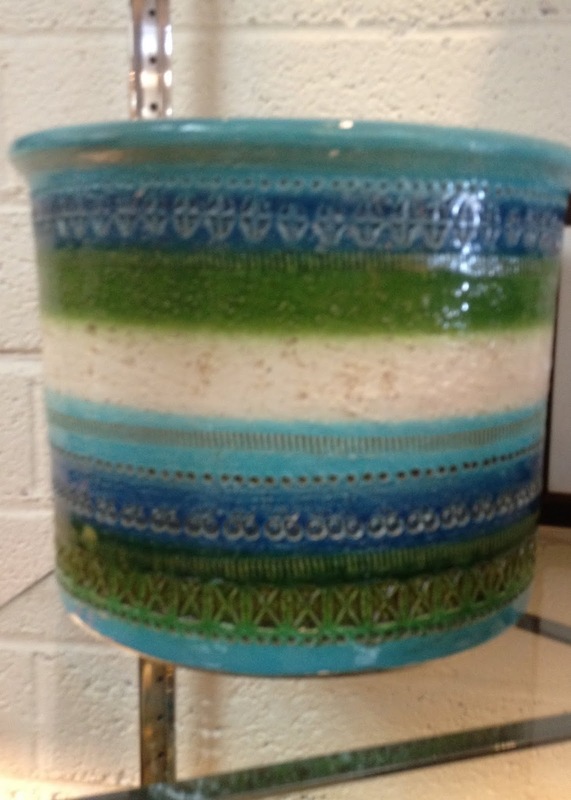 It would look great in any home. Just needs an updated shade probably. 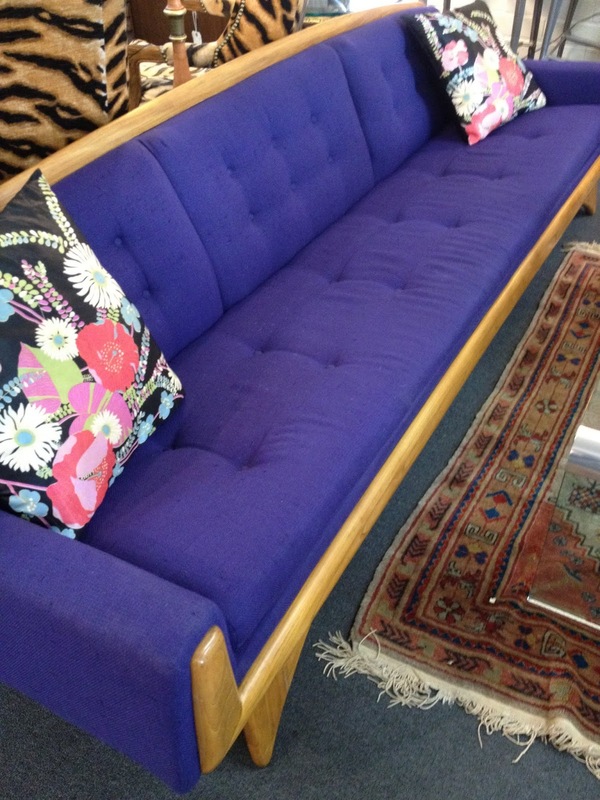 Fabulous blue Knoll sofa. So perfect. Original upholstery I believe. $4,200. 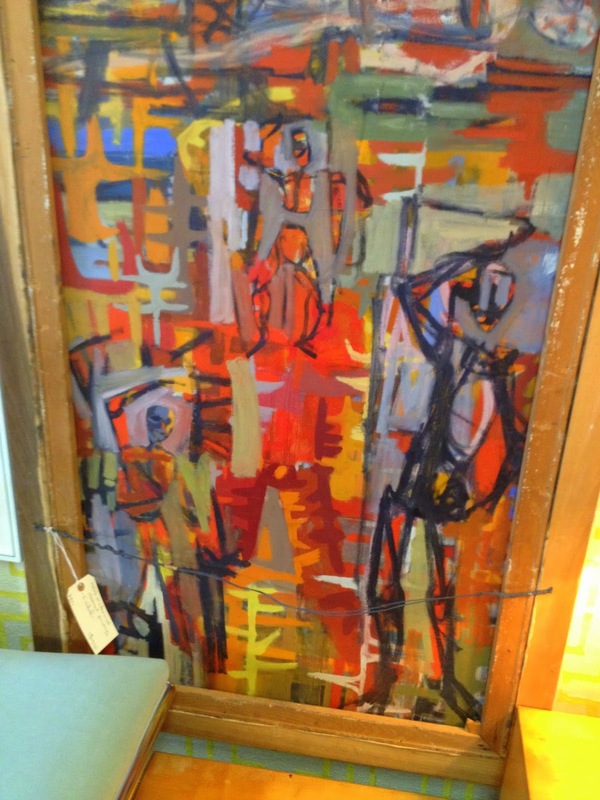 Now my favorite... for $900 the 1950's modernist reversible painting. I really want this. Here is the front. Which side is better? Hard to pick. I think I love the lady. But I also love the abstract piece on the back. I see at least two to three figures scribbled on it. Fantastic. Patina Decor is well laid out, and fully stocked with reasonably priced, one-of-a-kind treasures. A Vegas MUST SEE (for us mid-century modern folks). I could easily drive up with a truck and load-er-up. Maybe someday I will. 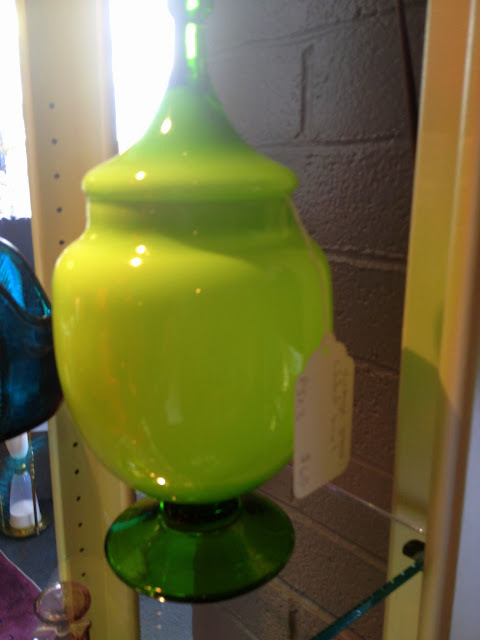 I have a few more mid-century vintage shops from Vegas to share, which I will, later this week. So much amazing stuff to love at that store! 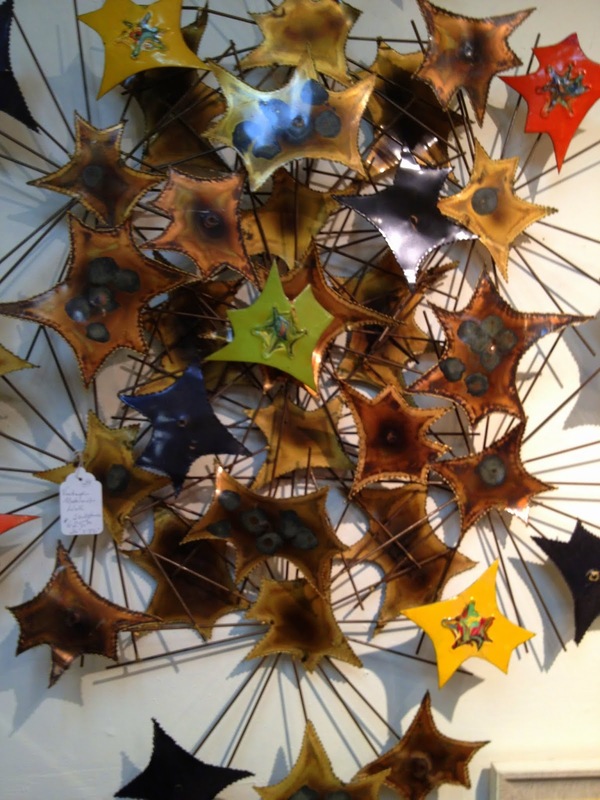 And I love the Russel Wright pieces. Chartreuse and avocado yellow are two of my favorite colors. Thanks for the shout! I remembered you loved those. Yay! 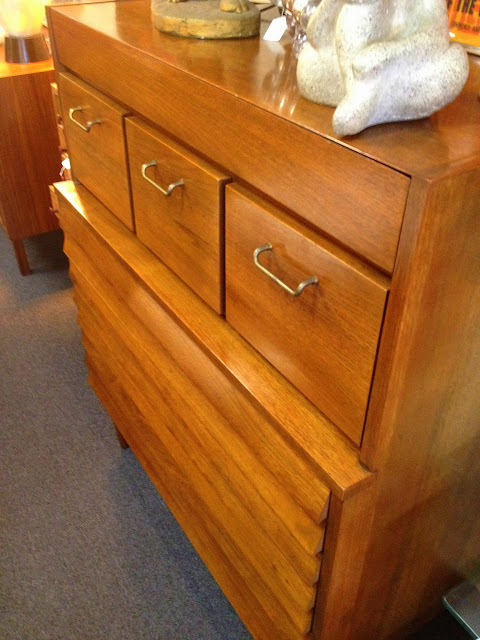 The dresser is actually a Merton L. Gershun piece for American Of Martinsville. I believe it is the Dania collection. I have the small credenza and it is a beautiful piece, solid walnut, so heavy I couldn't even move it an inch by myself just to plug in a cord behind it. Hi. A friend of mine emailed as well and said her dad owns this whole set. It is so beautiful! Nice pics! Thanks for sharing! And I thought the strip was all there was to do in Vegas. SO WRONG! Return trip is necessary now. I was in Vegas this summer. Little did I know... And it was Sunday. I think only 20% or so of the shops were open! It would seem you made good use of your time in Las Vegas, venturing off the beaten path. 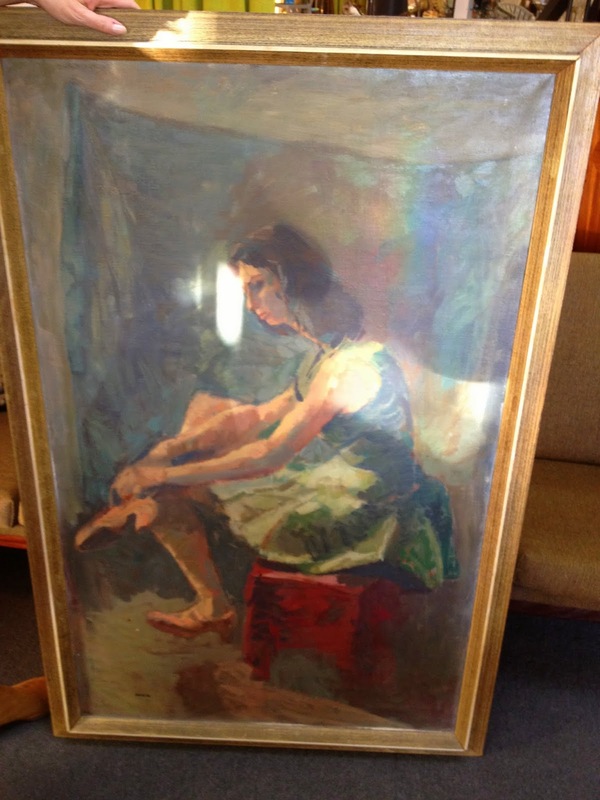 Interesting painting--do my eyes deceive me or is the image of the woman a companion piece to another painting you have of a woman? Mom (can I call you Mom?) you are absolutely right. She does look like the other lady painting. Now I really want it. Perhaps a phone call is in order. 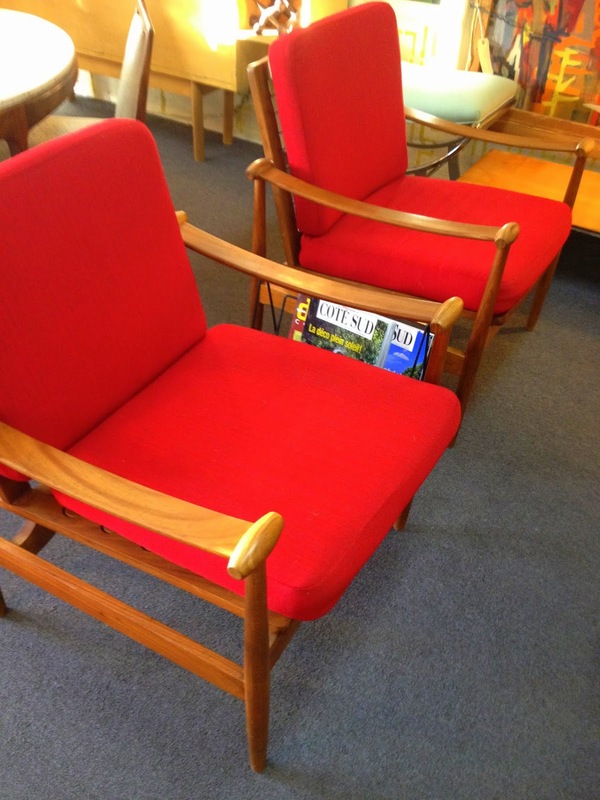 Blog expo and an awesome vintage store! Happy days. Looking forward to hearing more from the conference. Yes, this was lucky. I learned a lot (brain hurts) and got to see outstanding vintage pieces. The side-trip off the strip was a whim. I really didn't know they had all this stuff. I found one place on Yelp and everything else was there as well. Oooh Rebecca, so much to love and covet here. I vote for the back painting, I hope you buy it. It's stunning. Incredible store. It really was over whelming. Great job by the owners. Amazing store- thanks for the tour! I am going to have a few more stores coming up. Honestly, was beyond impressed with the concentration of mid-century modern in one little block. These are all pretty! I love all of the glassware in one of the shelves, they are all stylish. I'm just thinking how to compliment it on my light blue living room. Aren't they too glossy?